19 Saturday: What did Anne Lister do - in 1832? Anne Lister of Shibden Hall, Halifax (1791-1840) was a landowner, scholar and diarist. Her journals, written partly in her own private code, record her lesbian affairs with other women. BBC1's drama series opens in 1832. Jill asks: how could Anne Lister do all she did? Venue: Performance Space 1, Manchester Central Library, St Peter's Square, Manchester M2 5PD. British Library Panel - Diaries: Lives & Times. Ahead of BBC1's drama series, Gentleman Jack, Jill Liddington joins biographer Angela Steidele to discuss the Anne Lister journals ~ which run to 4-million words. With vivid readings, the Panel explores how Anne Lister recorded her lesbian affairs ~ and what else she did. 2 Saturday: Shibden Hall, Halifax - reopens after filming. 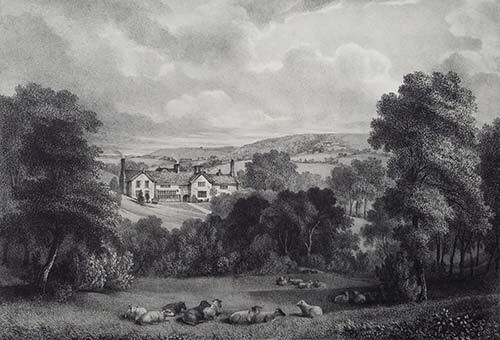 Shibden Hall, by John Horner, from Buildings in the Town of Halifax, 1835. Fundraising in aid of Halifax Women's Centre. please join us at 3.30pm in the Aisled Barn for Anne Lister talks by Helena Whitbread and Jill Liddington. This event is free, but as the Barn seats just 50 please reserve your place in advance. Afterwards, at 4.30pm, the Mayor will unveil the new blue plaque commemorating Anne Lister (1791-1840) of Shibden Hall: diarist, traveller, landowner & lesbian. The unveiling, organized by Halifax Civic Trust, will be held on the front lawn and everyone is welcome to attend. The Hall itself will be open 10am to 5pm; the shop sells Anne Lister books by both Helena and Jill. 19 Sunday: Anne Lister's Halifax: her public face. A 2-hour walk, recreating the town in 1832 that Anne Lister knew so well. She used Halifax for discussing business with her lawyer, shopping and catching up on political news ~ plus visiting the homes of the few families she saw as social equals. The walk includes short readings from Nature's Domain & ends with Q&A over tea & biscuits. Booking: opens on 8 April. Pre-booking is essential. 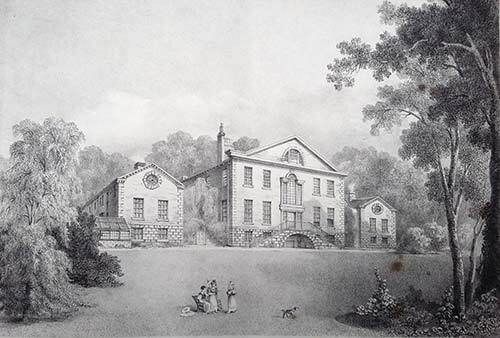 Hope Hall, by John Horner, from Buildings in the Town of Halifax, 1835. 23 Thursday: Writing Anne Lister - 7pm. How do you write about a woman who's already written a four-million word diary? About a woman whose every letter artfully resculpts the truth? Venue: Book Corner, Halifax Piece Hall, HX1 1RE. 16 Sunday: Anne Lister's Shibden: her private face. A 4-hour walk from Halifax, climbing slowly up Old Bank to Shibden. In May 1832, Anne Lister returned home despondent, betrayed by yet one more woman's marriage plans. Then re-acquaintance with neighbouring heiress Ann Walker of Lightcliffe changed her life for ever. Anne Lister deployed all her considerable skills to enthral & seduce this wealthy young woman ~ all out of sight of Halifax's prying eyes. We explore Shibden's 'landscape of desire', reshaped by Anne Lister for this courtship. The walk includes short readings from Nature's Domain & ends with Q&A over tea & cake. Booking: opens on 29 April. Pre-booking is essential.